Desenzano is a smallish town on the southern shore of Lake Garda in the north of Italy, with a population of around 25,000. 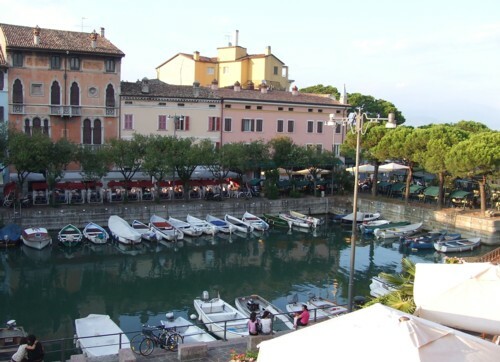 It's known as Desenzano del Garda (or occasionally 'sul Garda') to describe its location on the lake. The town is in the region of Lombardy and makes a convenient base for travellers using public transport, as it is on Italy's rail network. Desenzano is close to (and in the province of) the larger town of Brescia. The most convenient airport for the area is Verona. This southern end of Lake Garda is broad, fairly flat and not nearly as dramatic as the mountainous northern part. However, on a clear day there are still some good views, and Desenzano itself is a pleasant and comfortable place to stay. You can reach the lake's other resorts - including nearby Sirmione - by boat. You will need to study timetables first, though, and be aware that getting around the large lake is picturesque but can be very time-consuming. 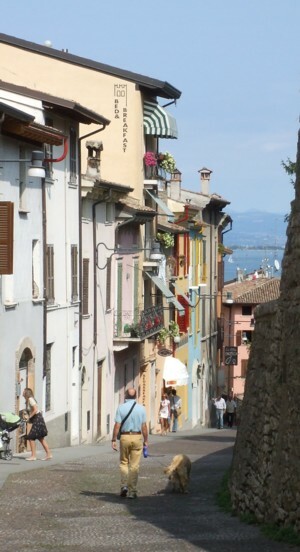 Desenzano del Garda has some pleasant winding historic streets between the town's castle on its hill, and the lakeshore below. A busy road runs along the edge of the lake, and on the inland side is a small peaceful harbour, where little boats are moored and swans glide about in front of several comfortable cafe-bars. A larger marina is situated along the shore, protected by an imposing harbour wall. Somewhat bizarrely, Desenzano is a trendy spot for partying northern Italians. On Saturday nights they flock here in their glitzy clothes and parade the streets in an evening passeggiata, eating and drinking at local bars and restaurants before fading off to their nightclubs and party spots. This parading is good for people-watching, but can be rather noisy for tired travellers. Desenzano's tourist information office is located by the old harbour and is well-stocked and efficient, with staff who speak good English. It's closed on Sundays. Here you can pick up information about Lake Garda, excursions, local attractions, boat timetables and maps of Desenzano. You don't really need much information to enjoy the town however. It's a pleasant place to wander with views over the lake, pretty lanes and enough shops for window-shopping. Once you have explored the waterfront and shopping streets, head up narrow Via Castello to the town's small fortress, the Castello. Various events are held here, including summer concerts. Parts are sometimes open to the public; you can often wander into the courtyard and look around. Desenzano's Roman villa is another historical sight worth visiting: the ruins, mosaics and a small museum can all be admired. Desenzano also has an archaeological museum (limited afternoon opening hours) with prehistoric and Bronze Age exhibits from the town and surrounding area. Both the villa and the archaeological museum are closed on Mondays. Ferries to the other lake destinations leave from a jetty close to the main harbour; there is a ticket office alongside. Check timetables and plan your journeys in advance. There are also bus services around the lake, although these can take longer. 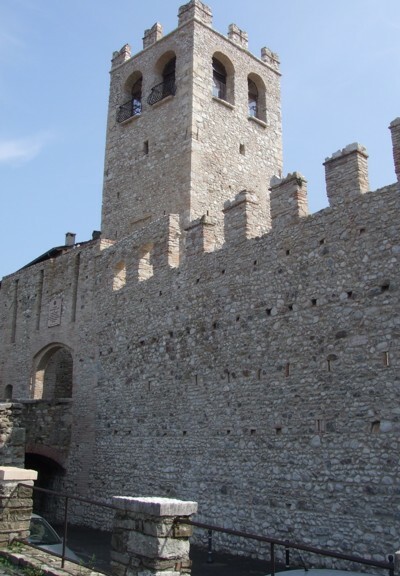 To reach Sirmione by bus, buy a ticket in advance at a news-stand. The service runs hourly, takes 20 minutes and stops by the station and by the port. A good place to stay? You should be able to judge from this page whether Desenzano is the right destination for you. We've used it twice as a base for visiting Lake Garda, and been pleased with it. True, the journey to the northern end of the lake is a long one. But we appreciated the transport links by rail and by boat. 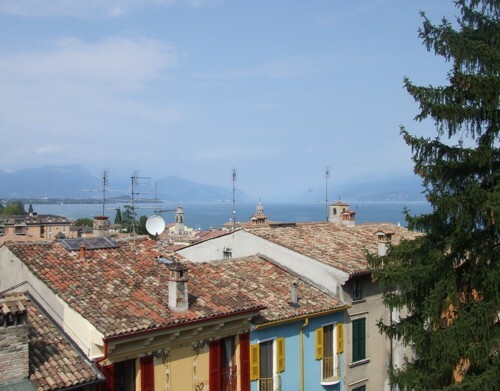 We also enjoyed the fact that Desenzano is not a purely tourist town, and we think there's a good balance between tourist and everyday functions - it's a real town, not just a 'resort'. Sirmione, by contrast, was pretty but so packed with tourists and overpriced restaurants that we longed to escape. Staying in Desenzano on a Saturday, we were fascinated by the parade of Italians in the latest fashions - including painfully deep tans and man-bags. A noisy street band near the hotel threatened to disturb our rest, but the sounds had died down by midnight. Desenzano's little railway station is uphill from the centre of town. It's an easy ten-minute walk downhill, but more tiring on the way up if you're pulling suitcases. The lazy option is to take the local bus service. There are three routes, numbered 1, 2 and 3. Tickets can be purchased on board for €1 per journey. To reach the heart of town, just leave the railway station, cross the road and head downhill, continuing straight on. The nearest airports to Desenzano are Brescia Airport (Ryanair fly there) and Verona. From either airport you can get a bus into the centre of town - Brescia or Verona - and from there you can travel by bus or train to Desenzano. It may be worth asking your hotel for advice - a few years ago we found an unpublicised free coach service from Brescia Airport to Desenzano aimed at guests with hotel bookings in the town. Rail services crossing northern Italy stop in Desenzano, heading from Venice across to Turin. Venice is a two-hour journey away, but note that there are several different categories of train on the route, with different ticket prices. One of the rare regional trains will cost half as much as an intercity service. There are also bus services to surrounding towns and further afield. A bus to Verona stops opposite the railway station, and there are also various excursions to Venice and other destinations - pick up some details at the tourist information office. If you are driving, you can reach Desenzano from the autostrada which connects Milan with Venice. Arrange parking before you arrive; Italian hotels don't always have parking spaces and you may need to pay for a place in a nearby car park. Your hotel will also be able to advise you on access through the town's evening/Sunday pedestrian zone.